Reporting deadlines approaching? Need help writing your report comments? Comments you can use straight away - Easy to use and a huge time-saver! 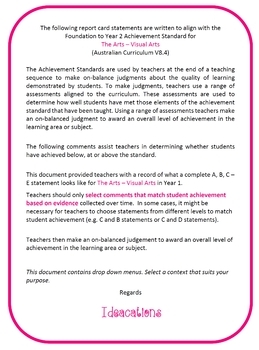 Save time and be confident your comments are well-written and align with the Australian Curriculum Achievement Standard. 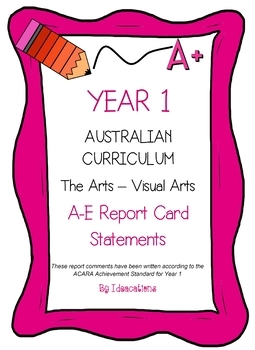 This file contains 55 A-E report card comments for Foundation Year - The Arts - Visual Arts. Suitable for all states and territories, my comments are currently being used in over 600 Queensland schools. Available in word format for easy cutting and pasting into documents. 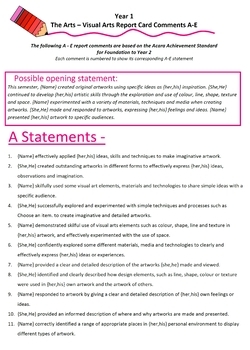 These comments are also perfect for criteria sheets and rubrics.